Our range of standard Oak Gates are made from fresh sawn oak with a planed finish without decoration. Please note fresh sawn oak will have some discoloration on the faces and some shrinkage & movement will be inevitable as the oak dries out. Venables Brothers can also manufacture bespoke gate designs if you require something special. 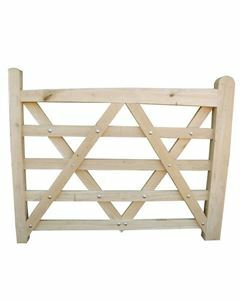 Our Oak Field Gates have a 125 x 75mm hanging stile with a 75 x 75mm closing stile. The rails and braces are 75 x 25mm and the top rail is 125 x 75mm tapering to 75 x 75mm at closing stile with a 10 x 10mm chamfer on all long edges (top rail only). The oak gate is constructed using M12 stainless fixings. 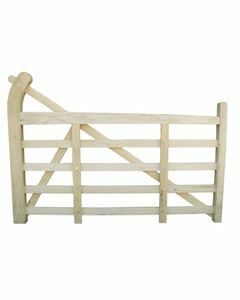 Oak Gate posts in a variety of Sizes. All Machined with a Weathered 4 Way top. Perfect accompaniment to your Solid Oak Gates. Please note our minimum order of £750.00 - Prices stated are PER POST.